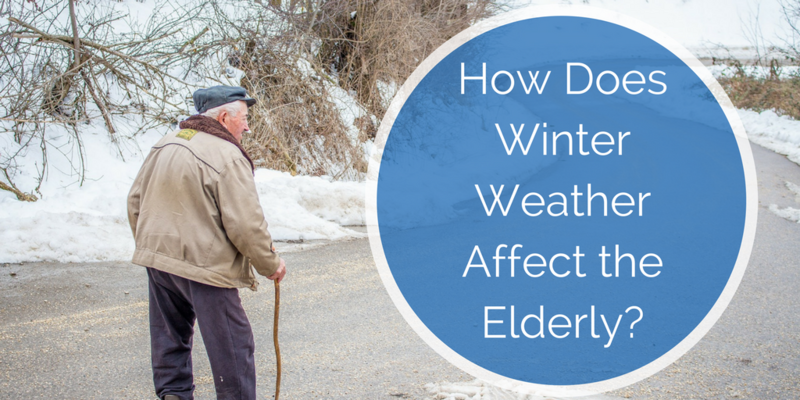 How Does Winter Weather Affect the Elderly? 12 December How Does Winter Weather Affect the Elderly? Winter is nearly upon us. With its shorter days and colder temperatures, this season raises health concerns for everyone, especially the elderly. Frigid weather can pose special challenges for older people because they don't respond to cold the same way younger people do. Here are some things to consider to help you or your loved one remain as healthy as possible throughout the winter months. If you suspect your loved one has hypothermia, seek medical attention right away. Fall risks. Snow and ice are obvious hazards that can cause anyone to fall, but seniors are especially susceptible to injury. Their limbs may stiffen up after spending time in the cold, making them temporarily less mobile even when they come indoors. Snow and ice, when tracked in, may make floors slippery, too. Balance problems can make navigating in the cold even more difficult. Chronic pain. The cold may aggravate conditions like arthritis. Often, pain flare-ups can be attributed, at least in part, to changes in barometric pressure. Pressure tends to drop before inclement weather sets in, and many people claim they can "feel it in their bones." Barometric pressure changes may cause tissues to expand, placing stress on the joints, resulting in pain and difficulty with movement. Heart problems. Cold weather causes the blood to thicken and arteries to constrict, placing more stress on the heart. These conditions increase the likelihood that an older person may suffer a stroke or heart attack. Research has indicated a correlation between cooler temperatures and higher blood pressure in individuals 65 and older. Delayed immune response. Because seniors have a delayed immediate immune response, winter epidemics like the flu can be especially troublesome. Compromised immune function can make older people more likely to experience other health setbacks, like pneumonia, after a bout of the flu. The Centers for Disease Control (CDC) reports that more than 200,000 people are hospitalized annually because of the flu, and the majority of them are seniors. Influenza can aggravate any chronic health conditions an older person already has, such as kidney failure or heart disease. Dehydration is also common among people who have the flu and can be especially detrimental for seniors. Sundowners Syndrome. People with Alzheimer's or other forms of dementia may exhibit higher levels of agitation, anger, confusion, and memory loss during the evening hours. In the winter months, symptoms of "Sundowners Syndrome" may intensify because the decreased daylight interferes with affected seniors' circadian rhythms (also known as their internal clock). Stay warm. To prevent hypothermia, keep the thermostat at or above 68 degrees and wear layers of loose-fitting clothing, even when you're indoors. Your body may have a delayed reaction to the cold, so even if you're venturing out for only a short time, wear a hat, scarf, gloves and other warm clothing to avoid losing too much body heat. To minimize the risk of falls, wear shoes with good traction. When navigating in snow and ice, consider using a mobility device, like a walker, even if you don't normally use one in warmer weather. Manage medications. Talk to the older person's doctor about medications or illnesses that can affect your loved one during the winter. Don't forget to mention over-the-counter remedies, too. Maintain a routine. To mitigate the impact of Sundowners Syndrome, follow a routine as much as possible to help the older person stay on a schedule. Keep evening activity and noise to a minimum. Allow as much natural light as possible to enter the home during the day. In some cases, medication may ease agitation and help the older person fall asleep. Don't overlook the importance of diet and exercise. Eating a balanced diet can keep seniors feeling their best through all seasons. Supplementation may be needed if they aren't getting adequate nutrients through diet alone. Getting enough vitamins and minerals can minimize the effects of certain health conditions and provide seniors with the strength and stamina they need for daily tasks. Moderate exercise can help the older person remain mobile, reducing the risk of falls and enhancing overall well-being, keeping the "winter blues" at bay. Keep up with immunizations. An older person, even one who seems relatively healthy, should keep up with recommended immunizations (including the influenza vaccine). Family members and caregivers should also be vaccinated for the flu to reduce the risk of illness as much as possible. Flu season begins in the fall and can run through the spring, but it tends to peak between December and February. The CDC recommends getting a flu vaccine by late October. Check in with your loved one periodically. It's always a good idea to check on your older loved one regularly, but it's critical during the winter months. Social isolation is a problem for many seniors, especially when cold weather can make it difficult for them to get out of the house. A lack of opportunities to socialize can have a negative effect on overall health. Many seniors enjoy the face-to-face communication made possible by Skype and FaceTime. Using these channels can better help you assess whether the older person seems unwell or needs assistance caring for himself or his home. Understanding how the cold affects seniors can help you ensure that they take proactive steps to prevent falls and illnesses during the winter. Looking out for their well-being during this season increases the likelihood that they can enjoy optimal health all year long. Get in touch with us today and find out what Bluebird Homecare can do for your loved one this winter.